We all have to install Windows 10, admit it. Even those, who also use MacOS, like me :). Of course, we all know and understand that various government agencies will get access to everything that you keep online or in the cloud if they want to. However, it’s one thing to know that you have nothing to hide from secret services, and another – to realize that commercial company is openly warning you that it will access your email and all your data if it wants to – “if necessary”. So how can we minimize this risk? A. Do not use automatic installation. Use Custom installation and turn off ALL check boxes on privacy screen. B. Do not use Microsoft Account – use local, or (better) corporate account. E. Do not use and even activate Cortana. F. Search / About your PC – rename your computer. H. Now we need to configure Group policies. 2. In Admin command prompt enter: gpedit.msc – this will run Local Group Policy Editor. (d) …Do not use other Windows 10 native apps – use verified third party apps which a re guaranteed not to share your personal information and data. DISCLAIMER: all the recommendations above is my own private opinion, which may change at any time without notice; I do not accept responsibility for errors, problems or mishaps of anyone following the information above; you are at your own risk. WHAT THIS REPORT IS ABOUT: Strategic direction the language industry will take in the coming years, driven and/or inspired by EU Horizon 2020 Program. WHY SHOULD THIS CONCERN YOU: all language industry players will be affected by the technologies that were presented, discussed or planned on the Summit. Some of the changes are pretty disruptive; others are quite tectonic. Studying Summit materials is the way to understand the future. There are so many events in language industry that it would take almost non-stop travel to attend all of them, not to mention those that are not so obviously language industry ones. You have to be really creative and have something to say to create the new one. Yet RIGA summit (http://rigasummit2015.eu/) managed to break the ranks of established ones and attract about 400 high profile attendees to visit Latvia – the country not exactly in the center of Europe. 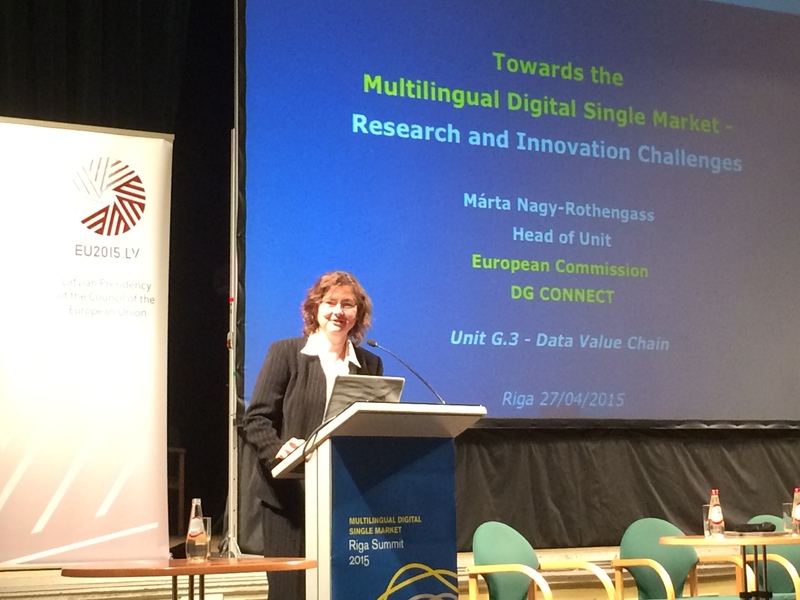 … and the is precisely what RIGA summit was focused on, creation of multilingual digital single market. 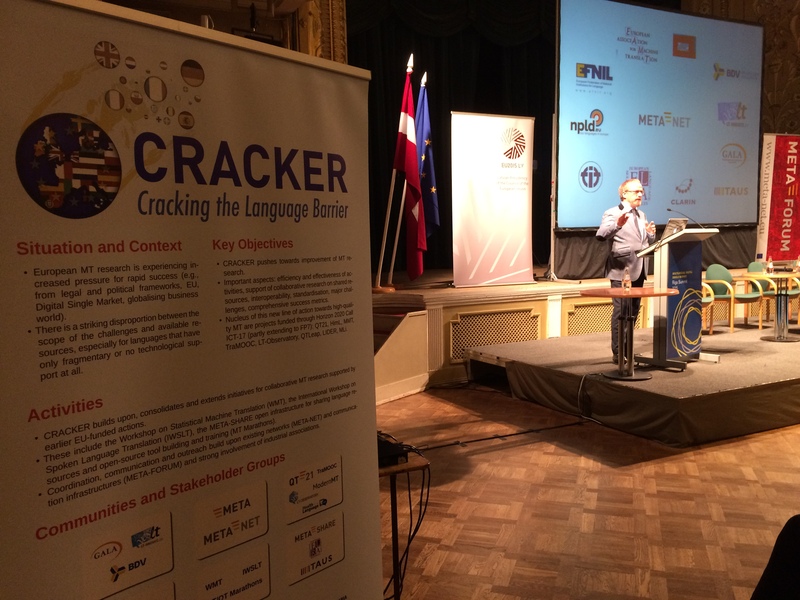 Technology, innovation, facilitation of making language barriers transparent without losing national identities and offering better and same services to all citizens of the multilingual Europe – these goals definitely concern language industry. And no, the summit was not about “funding”, or even “programs” – the summit was a brainstorming discussion on future breakthroughs and strategy, with showcase of most impressive technologies resulting from previous EU projects, some of them quite impressive (such as BabelNet, for example – more on that later). Those who were not able to attend were offered the option to view online broadcasting from the sessions. What I want to give you here, however, is a brief summary of the event from the participant and exhibitor viewpoint, hoping that you may find something useful for yourself without wandering through extensive Web site or dozens of hours of recordings. I am hoping to find time to compose more detailed accounts later. The Summit combined a series of high-profile events culminating several lines of work channels designed to develop the strategy for the multilingual digital single market: META-NET, MultilingualWeb and CEF discussion; there was also an exhibition of prominent technologies (“technology showcase”) which were of significant to the event agenda. The first day of the Summit was META FORUM; the second day – Plenary session; both days were showcasing technologies; the third day combined the Multilingual Web and CEF (Connecting Europe Facility) tracks of sessions. 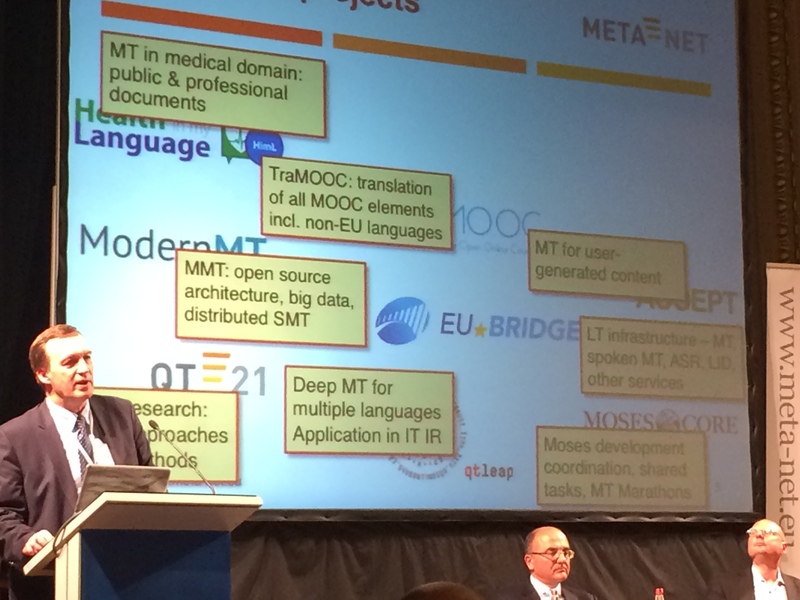 Hans Uszkoreit on five years of META-NET: Where we go from here? Note GALA logo on CRACKER project poster and on the main screen; GALA is participant of QT21 project. As I am browsing the photos from the Summit, I see that the materials are so vast and interesting that it would take several days and several separate articles to touch base on important and interesting sessions; this is what I will try to organize through GALA. There was a lot of great stuff, inspiring and strategic presentations from EU, research and business communities. 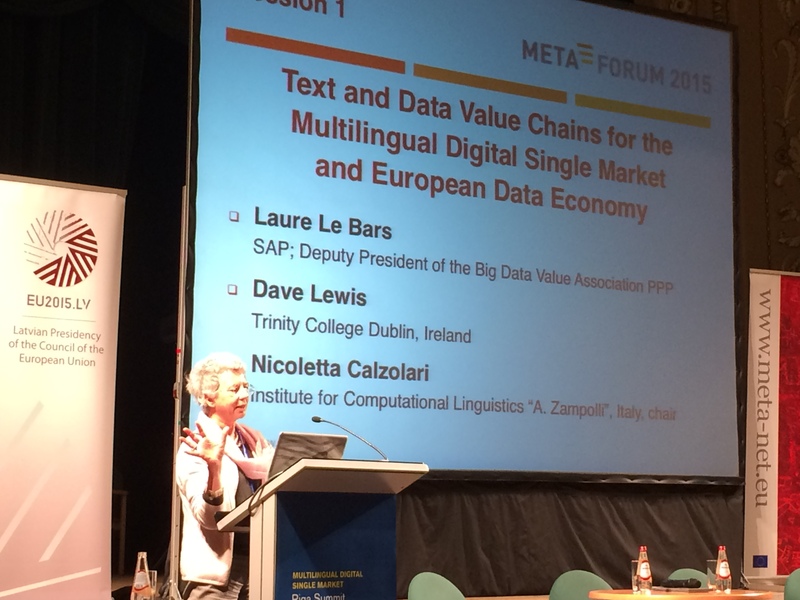 The panel on text and data value chains for the multilingual Digital Single Market shed some light on how text connects to big data and how text and data form value chains. 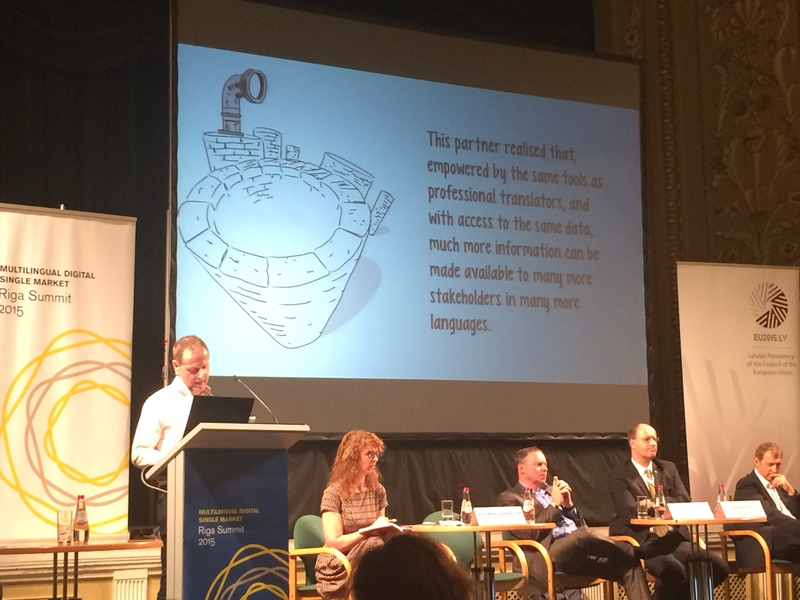 Panel on Text and Data Value Chains for the Multilingual Digital Single Market and European Data Economy. SAP explained how value is formed, and what can be done with big data. SDL made quite interesting industry keynote entitled “Challenges, Solutions and Visions for the Interactive Multilingual Digital Single Market” made by Matthias Heyn. It was quite interesting to see their “entire journey” and see them make key position statement and providing a hint into what is their vision. 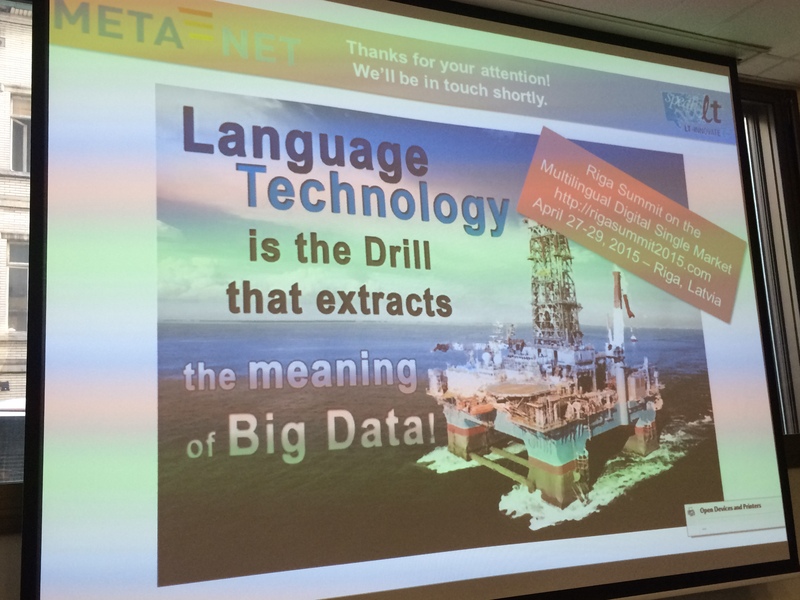 I think that this presentation was different from the regular one you see at translation industry event. They outlined the massive need for big data analytics to help identify and serve customers better, relying on social intelligence. 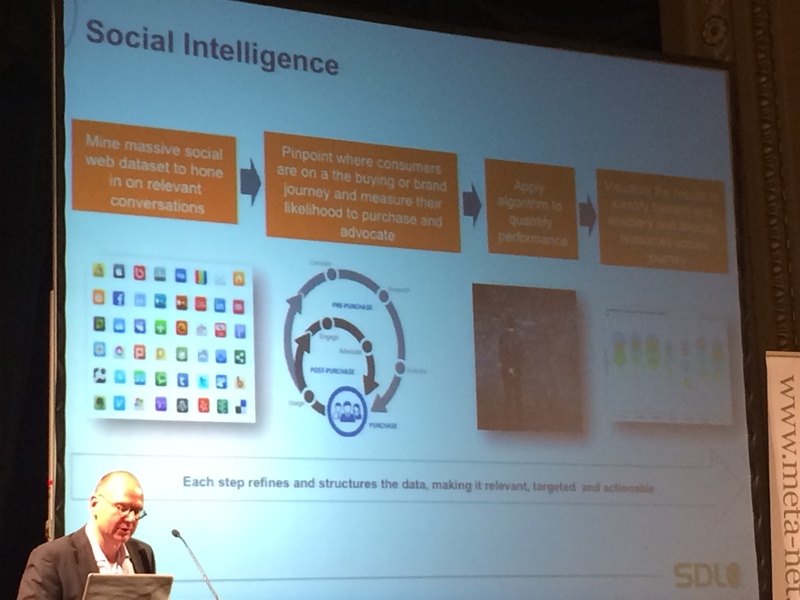 SDL believes social intelligence is key to serve customers better. There were some good thoughts on digital marketing, too. Well, I am all for it in theory; in reality customers and consumers do not want their experiences to be “managed”, so there’s natural serious barrier to this strategy. 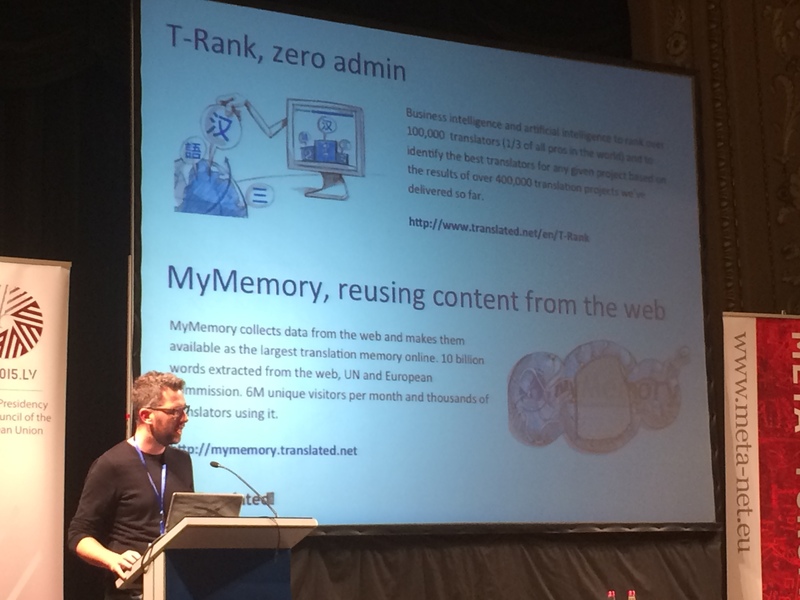 Jan Hajic from Charles University in Prague presented a concise yet powerful summary of EU machine translation research activities. 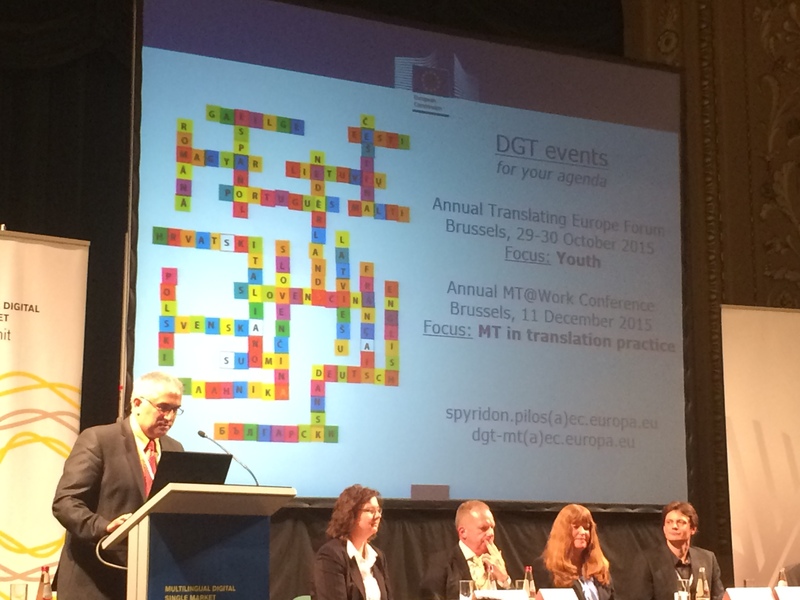 Overview of EU Machine translation research activities with contribution from multiple other EU-finded projects. 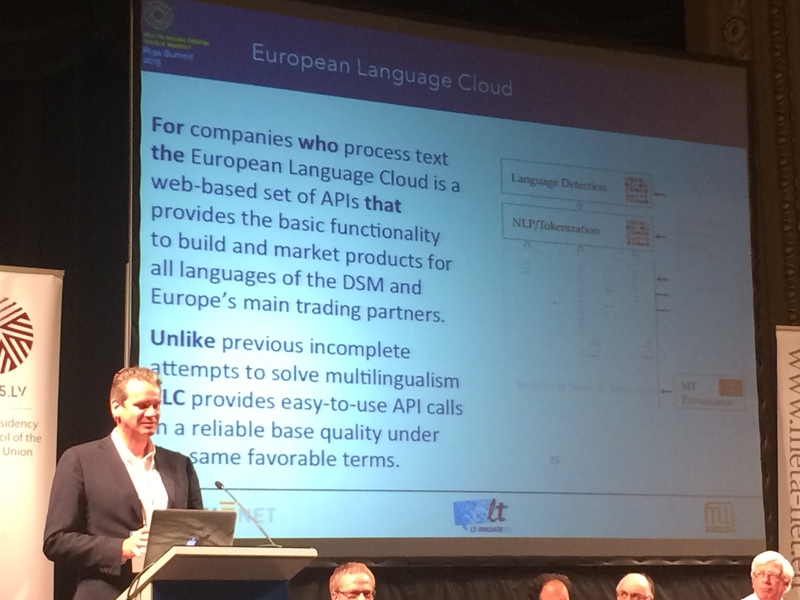 Jochen Hummel from LT-Innovate (www.lt-innovate.eu) presented a concept of European Language Cloud. Concept of European Language Cloud. The strongest and most interesting projects have received META award, among them Babel.Net and MyMemory. Babel.Net received the META-NET award, and not for nothing!. There were a lot of hints for the future. 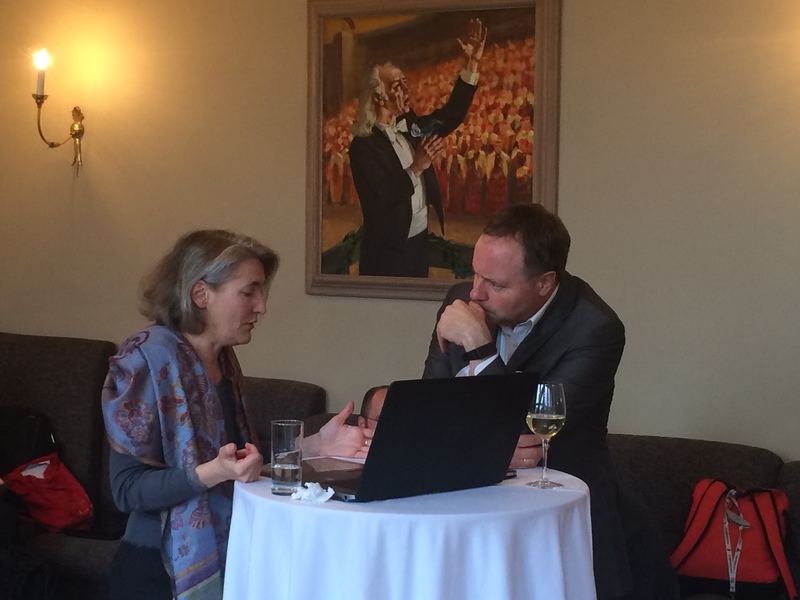 There was also a lot of thoughtful discussions between the meetings. 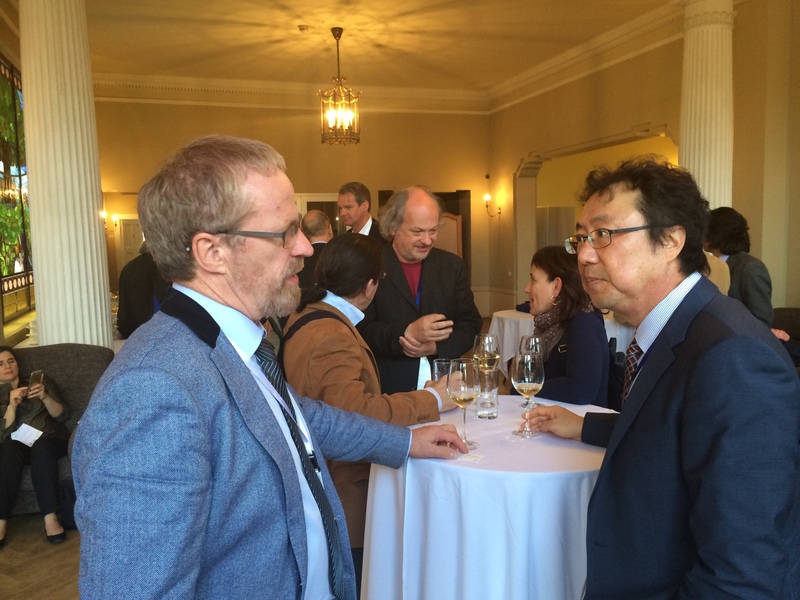 There was also fun of GALA reception and concert. 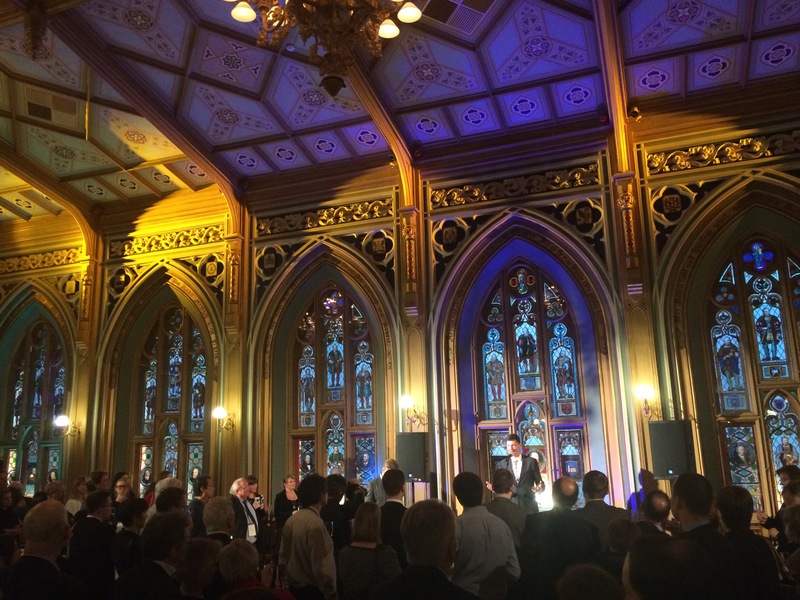 Andrejs Vasiljevs from Tilde is welcoming guests at the evening reception. 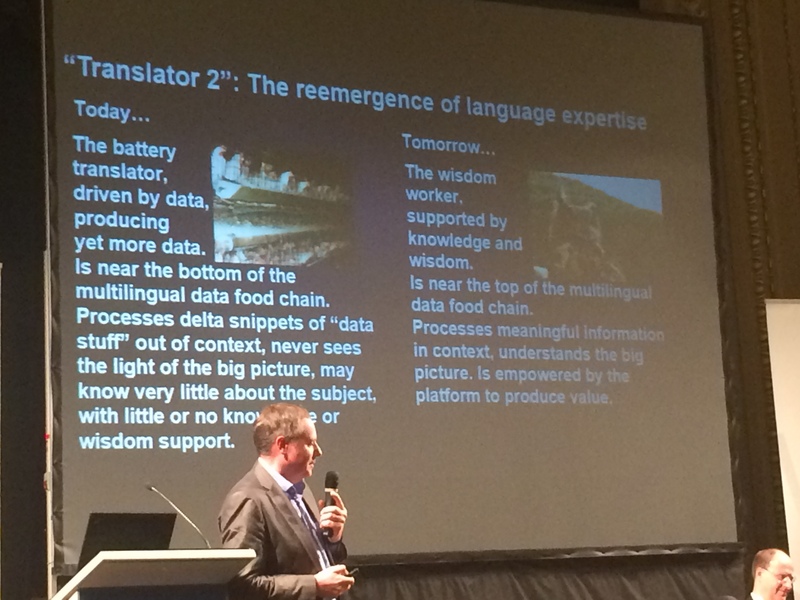 Some of the presentations were visionary predictions on what is going to happen to the language industry; and the fact that strategic visions from different experts could seem at first glance quite contradictory to each other – were they actually? – only makes them even more interesting. 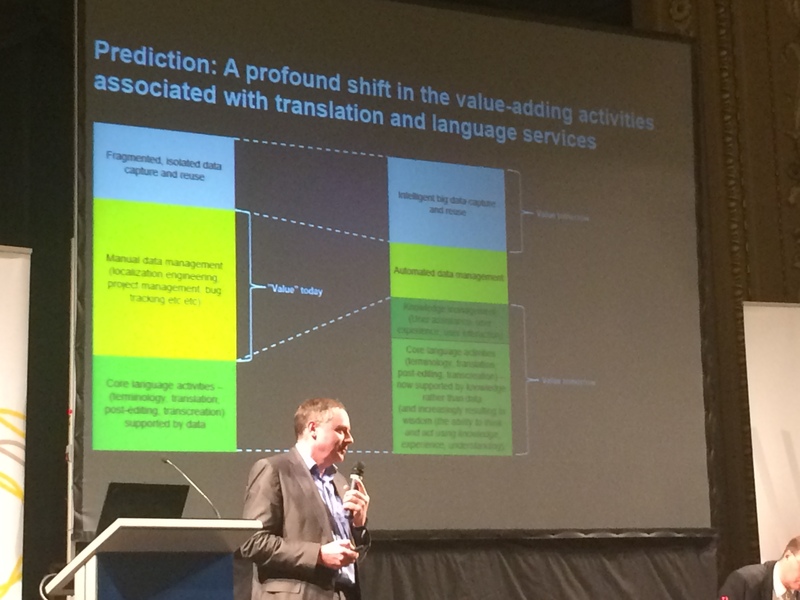 Chris Pyne (SAP) on profound shift in the value-adding activities associated with translation and language services. I really liked Chris Pyne’s vision of linguists becoming more important in the share of added value of LSP (TSP, etc.). Chris believes that as most project management tasks will become automated, the role of simplistic project management in value add will decrease and share of language experts and knowledge management of language will increase. What does this mean in practical terms for service providers yet needs to be discovered – rich topic for discussion. For example, mesmerizing presentation of Robert Etches from TextMinded made quite different point. A lot more can be done without professional translators? Will the future have place for both visions? Or will they be somehow combined? What’s the place of technology and professionals in the future, and does automation threaten or empowers people? The debate is far from over. 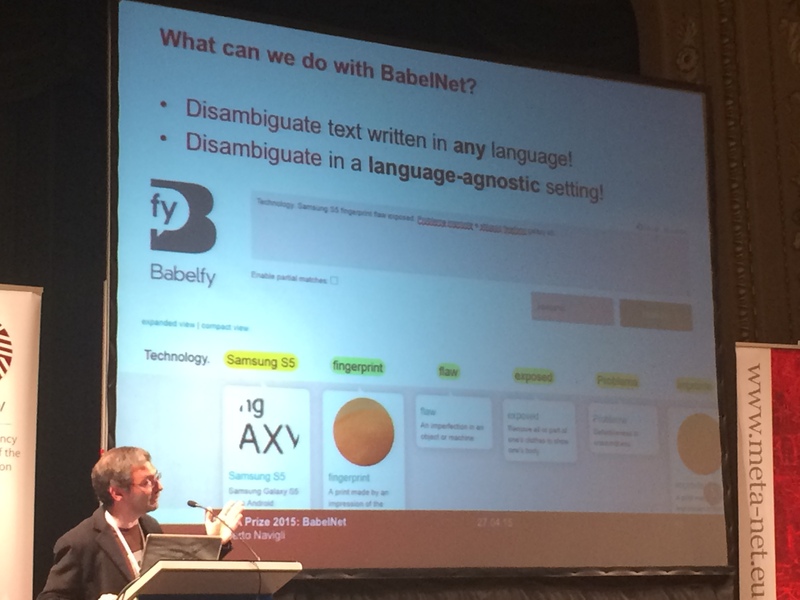 Is this the future of professional translator, or only of select few of them? What is clear, however, is that the machines and systems will play bigger and bigger role, which was the point made by Dr.RobertDale from ARRIA. Dr.Robert Dale believes that it’s time for our systems to “talk back”. What was great about the Summit is that some of the presenters were really captivating and strategic on a very high level. My favorite among “keynote’- like presentations is the speech made by Algirdas Saudargas, MP of European Parliament (below). He made a very strong point that multilingualism creates new information, and blending information from various cultures and languages creates entirely new level of information for the society. 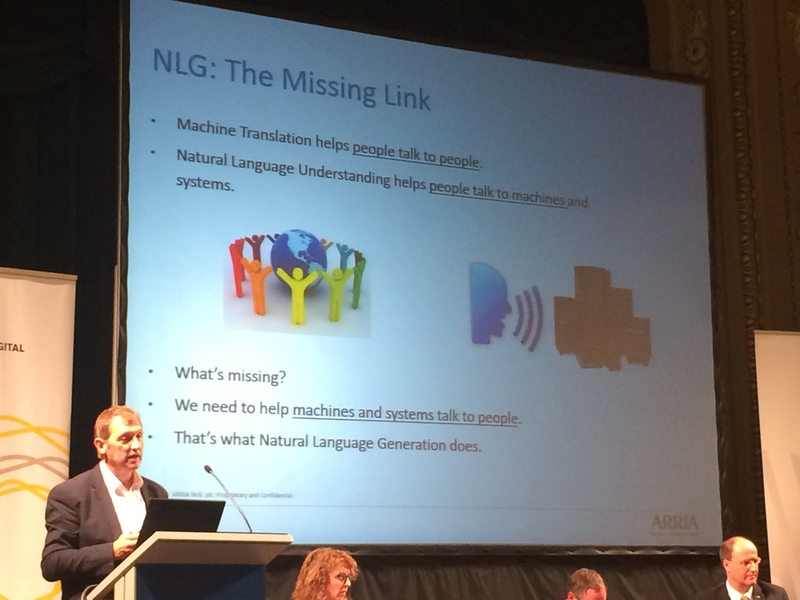 Algirdas even used a very strong (and a little bit overreaching) advice “not to be immersed in monolingual noise” – well, this may be debated but the point that multilingualism creates new information, and new level of information is undeniable of course. The point that Algirdas made is that multilingualism should be a strategic decision for the multiethnic society, even though it may come at additional cost. He compared government support of the multilingualism with strategic decision to build bridges. Well, it is true that infrastructure projects cannot be handled by private sector, they are simply too large for that; and it’s precisely why European plan to work towards the Multilingual Digital Single Market paves the way to the better future, in fact, for the entire humanity. I personally think that in this particular aspect Europe is definitely ahead of other regions. Although, I must humbly mention that this vision of MP comes a bit contradictory to the statement of the EU officials that “the industry should not only say that it is important, but also must be able to prove it”. So the messages coming from officials were not without a bit of cold rain, too. This topic is also quite rich for discussion and definitely a pain point for our industry. Nevertheless, the the focus on multilingualism in Europe is there more than in many other regions, on a very high level. This is exactly why this event is relevant for the global language industry and I really recommend to look further into the materials that will be coming out around these topics. Innovative and very strong presentations from the industry and research community are noteworthy to cover in separate articles. The winners of META awards, such as BabelNet, deserve special attention. I am also very proud to inform you that OSELI initiative was introduced on the Summit too, we had a booth at Technology Showcase (more on OSELI later). 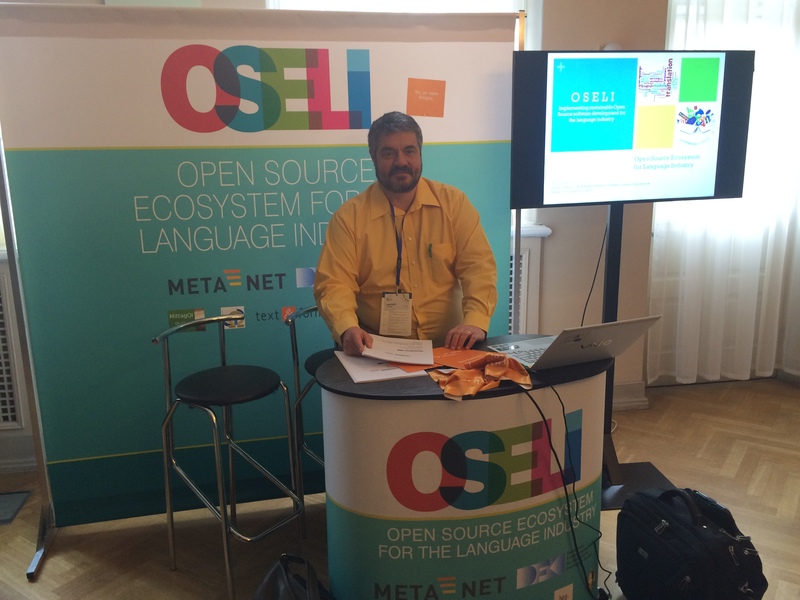 The booth of OSELI initiative at Technology Showcase of RIGA summit. 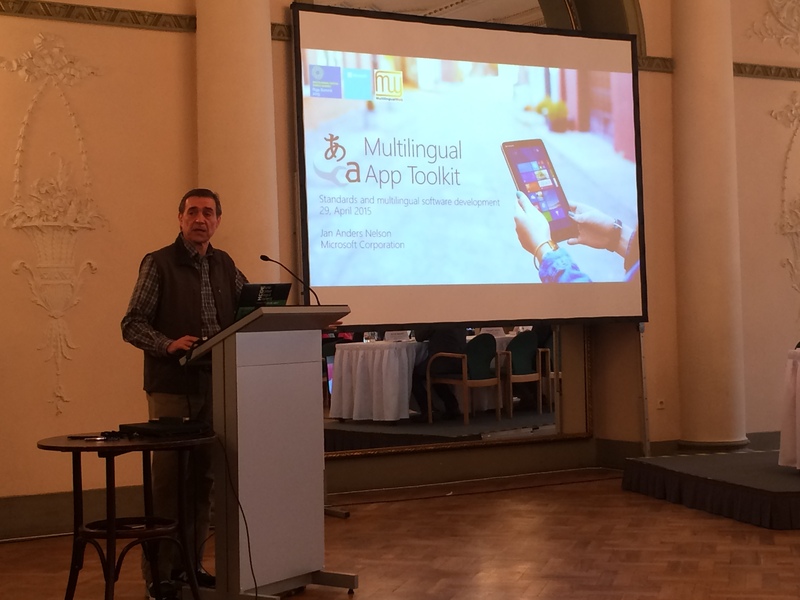 It is also worth mentioning that during the third day of the summit during the Multilingual Web track Jan Nelson from Microsoft presented his Multilingual App Tookit. Microsoft Multilingual Web Toolkit presentation. 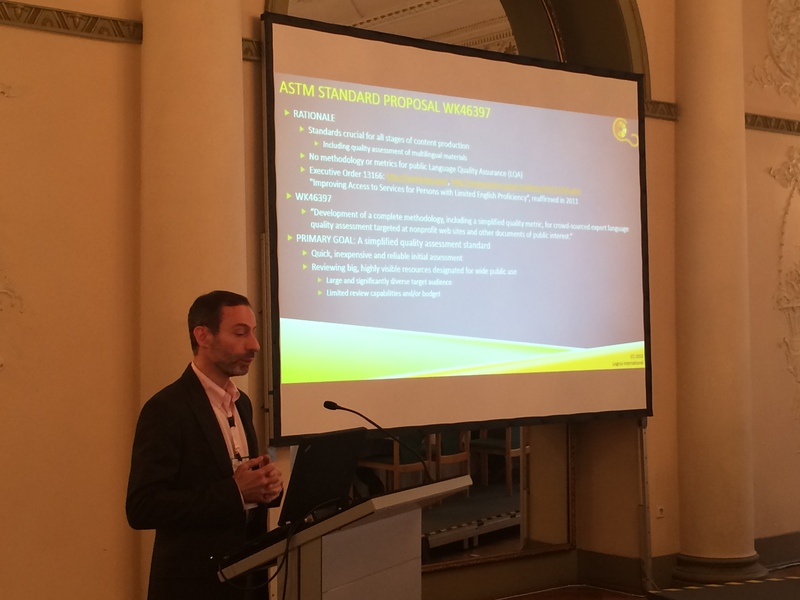 Leonid Glazychev from Logrus presented Language Quality Evaluation methodology which is the basis of ASTM WK46397 draft. The presentation explaining what’s behind ASTM WK46397 draft. The events that worth visiting were reminded of at the Summit. DGT events were reminded of. 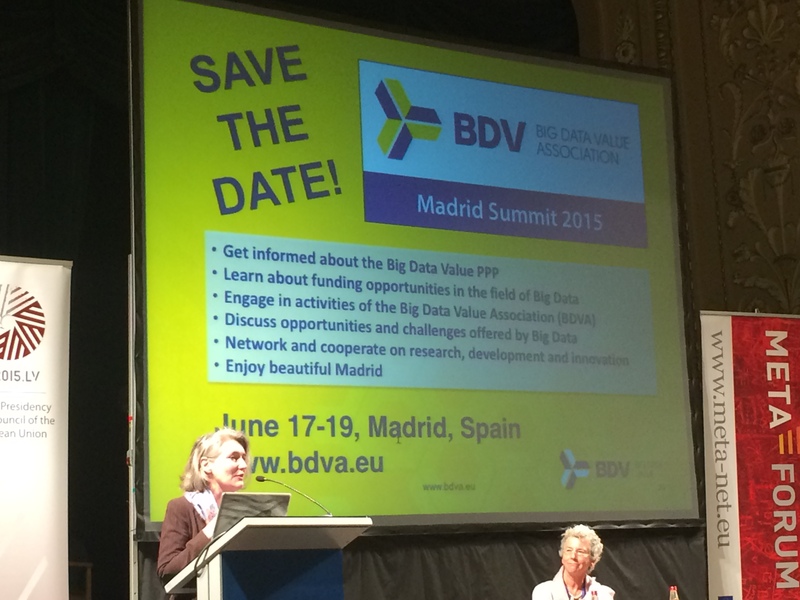 Also, those of you who are interested in Big Data (and not necessarily language related) may be interested to attend the Madrid Summit of the Big Data Value Association (www.bdva.eu) which will happen on June 17-19 in Madrid. 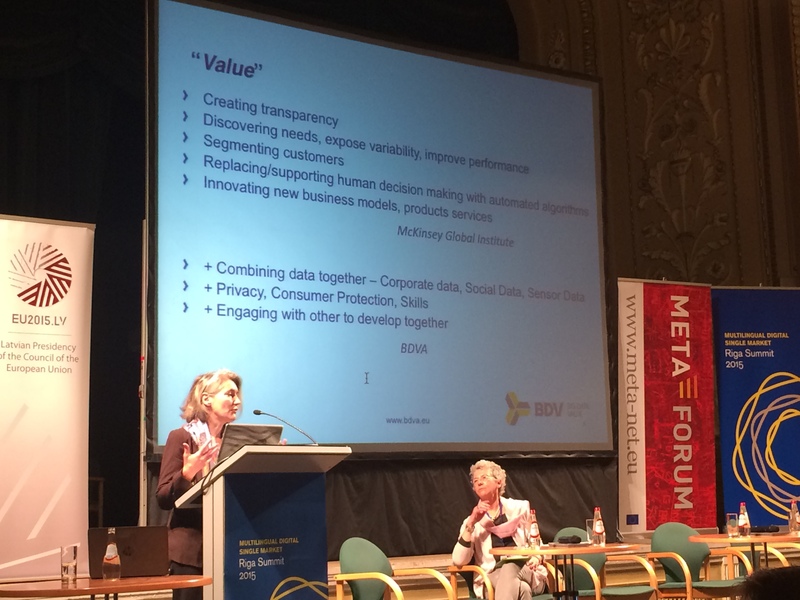 The thing is, a lot of innovation for future digital single market is expected to happen in the field of the Big Data. 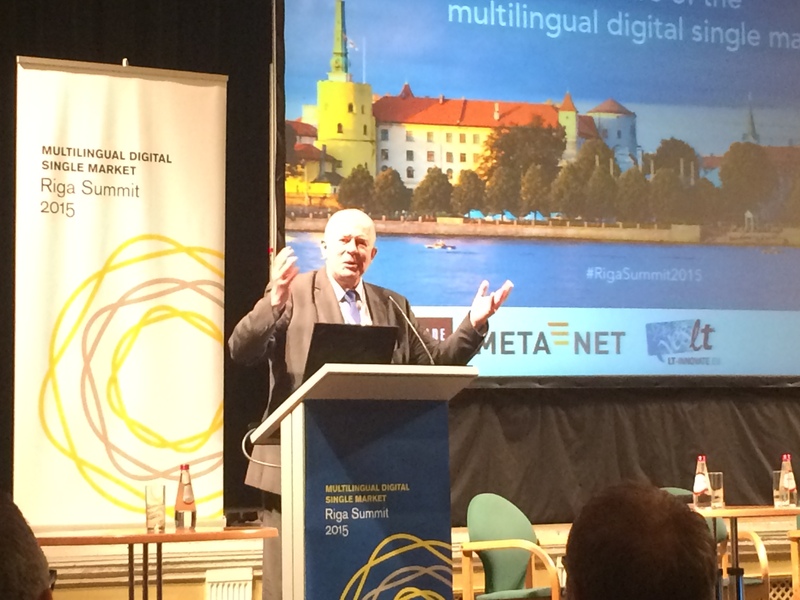 Once again, the Summit Web site containing some information, is here: http://www.rigasummit2015.eu. I hope the organizers will make summit presentations available to the public. If you have questions about the summit, please email to crisp@gala-global.org, or to my personal email address. Stay tuned for further updates and posts! WHY SHOULD THIS CONCERN YOU: all language industry players will be affected by the technologies that were presented, discussed or planned by the EU Horizon 2020 program. Some of the changes are pretty disruptive; others are quite tectonic. Studying materials referenced here is the way to understand the future. On January 16th I attended Brussels workshop on Multilingual data value chains in the Digital Single Market (The official page of the event). Apart from the very good summary that you can get on the Web site I really recommend you to have a look at presentations of the workshop, which comprise both visionary presentations on the Multilingual Digital Single Market (DSM), and reports on successful, leading projects already funded, conceived and completed, and the roadmap for the future research and events. 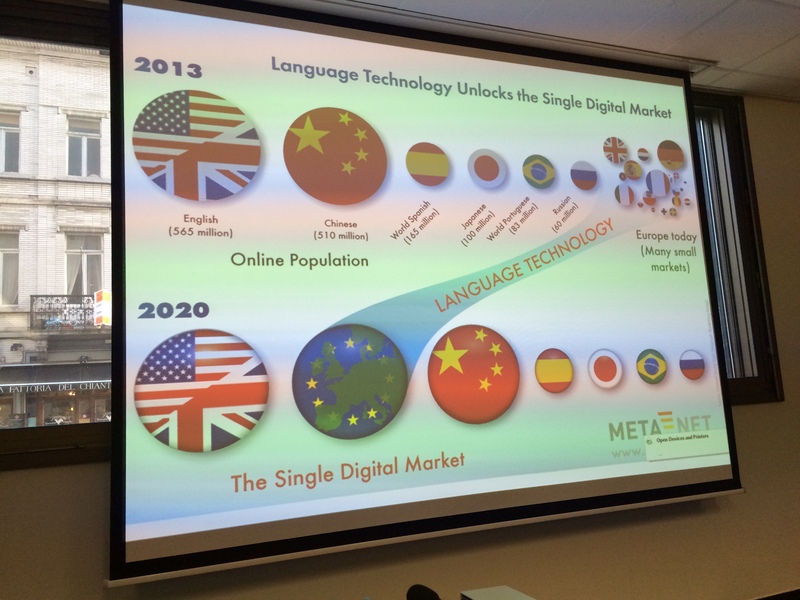 Language technology is to make Europe the single digital market #2 in the world. Of course, other presentations may also be of interest; please, look at the background information section of the Agenda document. So, in the end of the day, we are also drilling :). I really encourage you to go to the event page and download and browse presentations. The material is trend-setting, strategic for the industry.